It was beginning of December, my hubby and kids picked up a book on cookies especially for me from the library with the notion that 'Mommy' would bake lots of cookies from there. I was really interested in something unique or different and picked this Cottage Cheese Chocolate Crinkle cookies recipe. It was a wise choice. When I made it for the first time, it dissipated into thin air within an hour. This recipe is a sure keeper for my family. The cookie is crusty outside and soft inside and chocolaty enough to please the kids. Sift the flour, cocoa powder, salt and baking powder into a bowl and keep it aside. Beat the soften butter,sugar and egg till creamy with wire whisk. Add vanilla extract and cottage cheese to the egg mixture and beat well. Now incorporate the dry ingredients using a wooden spoon or rubber spatula till it forms a loose dough. Using a cookie dough scoop, take enough dough and drop 12 balls onto the baking sheet lined with parchment paper and bake for 10 - 12 minutes. Take the sifted confectioner's (powdered) sugar in a wide plate. Dip the top of the cookie in powdered sugar and keep in air tight container. There is no need to drain the water from the cottage cheese. These cookies remain soft and delicious for one week when stored in air tight containers. These cookies are super moist and you won't even taste the cottage cheese in it. I didn't refrigerate the dough before baking. You can refrigerate the dough for 30 minutes if you think the dough is very hard to handle. The dough scoop really helps to make balls. The stickiness of the dough will be dependent on the weather where you live. You may have to refrigerate the dough if you live in warm climate. Also you may have to keep the cookies refrigerated in warm conditions. Cookies are must have in december ...Love the colour and the use of cottage cheese in it..Wish you and you family a very Happy New Year. Gosh, these look really great. I don't think I've ever had cottage cheese cookies before - need to try these. Thanks. And Happy New Year! never used cottage cheese in a cookie. will have to try it! They look amazing. 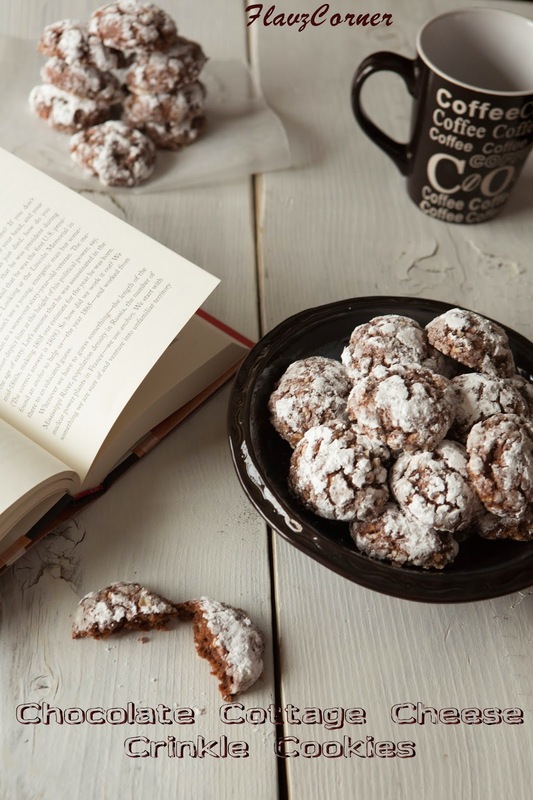 I love crinkle cookies, looks so fancy. Yum. 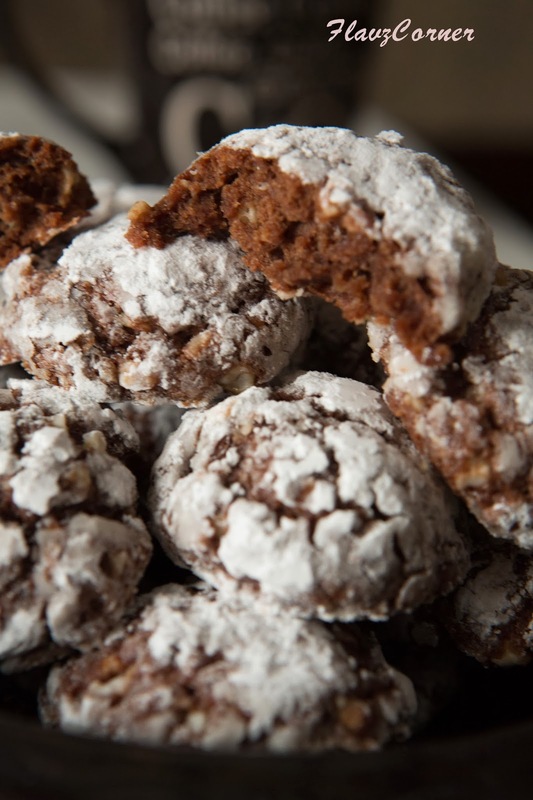 These crinkle cookies look so moist inside! OOh wish I had some of these to go with my cuppa coffee! Happy new Year! Dec 30thnu aano dec is almost over ennu parayunne? ;-P Happy New Year to you and your family Shibi....havent been on blogging front for a looooong time now. from mid-dec i've been sick-better-sick and still sick :-( just want to get out of this state n start cooking n clicking again. 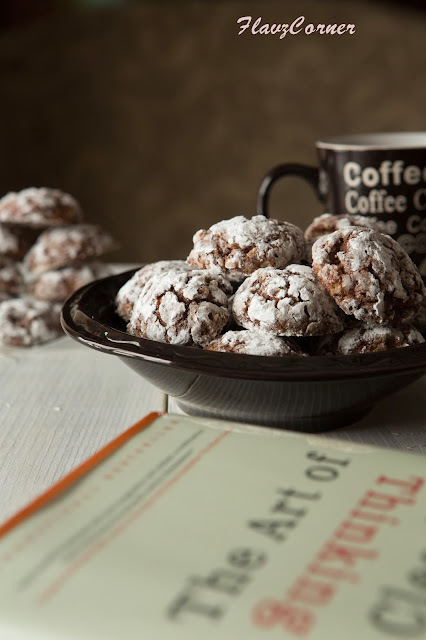 You know Manish went n bought choco crinkle cookies from the bakery on 31st...kind of like he read my mind abt me reading n drooling at urs :-) Will try yours sometime soon. Appu will also like it I'm sure. perfect and so neatly presented..loved the colour theme.. Your cookies look perfect! 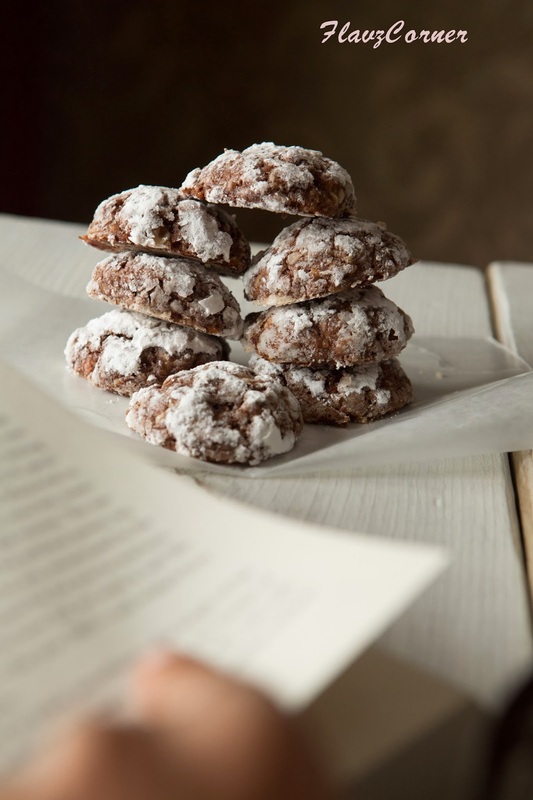 I have a recipe of crinkle cookies but somehow I never got to make them for so long! However I have bookmarked your recipe since it says cottage cheese. Last year, I tried biscotti with cottage cheese and it would be great to try cookies with cottage cheese. Thanks for sharing. Made these yesterday - SO DELICIOUS!! For some reason mine did not turn out to be crinkle cookies, and were a bit flatter. Nonetheless, the taste was scrumptious!! Wonderful cookies!